Thanks to an alert citizen working in the area, the Michigan Department of Agriculture and Rural Development (MDARD) today confirmed hemlock woolly adelgid (HWA), an invasive tree-killing pest discovered in Ottawa County in June, has now been found at locations in southwestern Muskegon County. 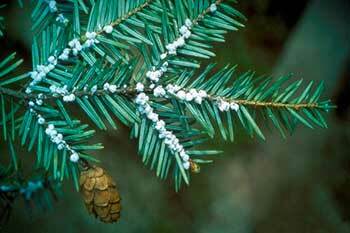 The finds in Ottawa and Muskegon counties are the first instances of HWA occurring in native forest hemlock. MDARD and its partners have been actively monitoring and controlling HWA since 2001, but until this year, all HWA infestations found in Michigan were restricted to nurseries and hemlock landscaping. Each infestation was treated, eradication activity took place, and continued surveillance occurred after eradication activities were wrapped up. Hemlock trees are typically green in color, but in advanced HWA infestations, twig and branch mortality can occur, giving infested trees a grayish hue. The small cottony masses characteristic of HWA are found on the underside of the branch at the base of the needle; they are never found on the needles themselves. HWA can be very difficult to detect at low population levels because the insect is so small. Since its discovery in Virginia in 1951, HWA has spread rapidly across most of the native range of hemlock in the eastern U.S., decimating hemlock forests from Georgia to Maine. To protect Michigan’s hemlock forests and the wildlife they support, MDARD has maintained a strict quarantine against out-of-state hemlock since 2002. Current and past infestations in Michigan are likely the result of hemlock from these areas shipped into Michigan prior to, or in violation of, this quarantine. To report a possible HWA detection, contact MDARD at 800-292-3939 or MDA-info@michigan.gov.